All affiliate accounts are organized in the Affiliates > Manage Affiliates section. Whether they have been added manually or signed up through the affiliate registration form, their profiles are handled here. In this section, you can add, edit and remove affiliates manually. If you are using Affiliates Pro or Affiliates Enterprise, you can configure additional options for affiliates, including setting specific referral rates or commissions. ID : Every affiliate is assigned a unique, automatically generated identifier. Affiliate : The name of an affiliate which usually is the first and last name or a company name. Email : The affiliate’s email address. If the affiliate is associated to a user account, this email can be different from the one that is related to the user account. They usually are the same and the system will place a warning sign besides the email address in the listing if they are not. 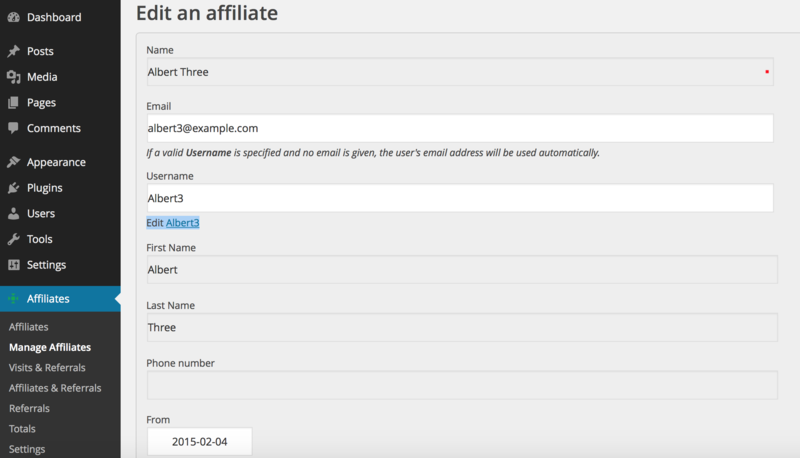 Username : An affiliate can be associated to a user account. If they are, the username will be displayed. Affiliates who sign up via the affiliate registration form will be associated with the newly generated user account automatically. From : This reflects the date from which an affiliate has joined the affiliate program. Until : This date determines the validity of an affiliate. It is either undetermined, which implies that the affiliate is an activate member of the affiliate program, or it is set to a date beyond the From date. No referrals will be credited to an affiliate beyond the Until date. Use filters in Affiliates > Manage Affiliates to narrow your affiliate listing down to desired results. To show or hide the Filters panel, click the Filters button. To use filters, set the appropriate options under Filters and click Apply. The filter settings are persistent across sessions, so next time you access the affiliate management section, you will see the same filter settings and results. If you would like to reset your settings to show all results, click Clear. Note that filters are applied on a per-user basis, different affiliate managers will use their own independent settings. Id : Use this to search for an affiliate by ID. Only the affiliate that matches the given ID will be shown. Name : Use this filter to search for an affiliate by name. All affiliates that partially match the name will be included in the result set. Email : Filter by email address. Username : This is used to search for affiliates by their username. Partial matches will be included in the result set. From and Until : Restricts the results to those who are valid within the given dates. One or both options can be used. Include inoperative affiliates : Includes affiliates who are not currently valid, meaning their Until date is before the current date. Include active affiliates : This includes affiliates who are admitted to the affiliate program. Include pending affiliates : This will include affiliates who are pending review to be admitted to the affiliate program. Include removed affiliates : Will include affiliates who have been removed from the affiliate program. Show accumulated referral totals : This will include statistics on referrals related to each affiliate. With Affiliates Pro or Affiliates Enterprise, additional registration fields and other options are also displayed here (more columns can be displayed). With these premium versions, you can also export affiliates data directly on this screen. The system allows to maintain affiliates with and without a user account. If the new affiliate should be able to log in and review his performance on the Affiliates Dashboard, create a new user account first and relate it to the new affiliate account by indicating the Username. Creating affiliates manually is not necessary if you let affiliates sign up automatically. The steps described here are thus optional and can be used when needed. To manually add a new affiliate go to Affiliates > Manage Affiliates and click New Affiliate. Fill out at least the Name of the new affiliate, you can leave the rest empty or provide the Username if the affiliate already has a user account. 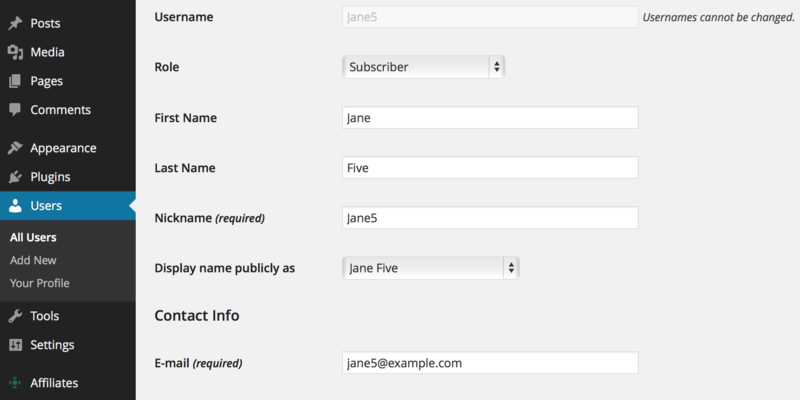 You can also add a user account later if desired. If you provide a Username the email associated to the user account will be used as the affiliate’s email. The From date will be set to the current date automatically, leave it empty unless you would like to enable the affiliate at a certain date. Click Add to create the new affiliate. If you are using Affiliates Pro or Affiliates Enterprise, you can define additional options after the new affiliate has been created. To edit an existing affiliate go to Affiliates > Manage Affiliates and click the Edit icon – here you can modify the email address, the username or the validity dates. The same basic options apply as when a new affiliate is added. The link “Edit username” provides access to edit the user’s profile. If you are using Affiliates Pro or Affiliates Enterprise, you can define additional options. To remove an affiliate go to Affiliates > Manage Affiliates and click the Remove icon for the desired affiliate. Confirm your decision by clicking Remove. Note that if you simply want to invalidate an affiliate so that the affiliate will not be credited with referrals anymore, you can set the appropriate Until date by editing the affiliate. This will retain information displayed for that affiliate and the affiliate will still appear in the affiliate listing when the Include inoperative affiliates filter option is checked.